Linda joins APP as Peer Support Facilitator for Lancashire & South Cumbria! "On the 29th of October I joined the APP team as a peer support facilitator for the Lancashire and South Cumbria region. This coincided with the open day of the new Chorley MBU, Ribblemere. I had Postpartum Psychosis after the birth of my daughter in 2012. Having no history of mental illness it was ‘out of the blue’. The birth was very traumatic. She was breech and an emergency cesarean was required but even that didn’t go smoothly. My daughter ended up being on intensive care in the neonatal unit. Eleven days post-birth I was sectioned to a general psychiatric ward and diagnosed with PP. Eventually I was then transferred to a Mother and Baby Unit and reunited with my daughter. After leaving the MBU I ended up very depressed and anxious but eventually I made a full recovery. One of the pivotal points of my recovery was speaking to someone on the phone who had had PP twice. This was the first time I had spoken to someone with PP. To hear that someone has PP, recovered and then went on to have another child and recover again gave me the hope and strength that I could and would get better and I did. This is one of the reasons why I wanted to be involved in this project and be able to offer face to face peer support for women with PP. I have previous experience of offering face to face peer support to mums through volunteering in the NCT Parents in Mind pilot project. My role within the APP team involves working with Lancashire Care Trust providing information and face to face peer support to mums/families at Ribblemere and also for any individuals affected by PP in the community. I have had an amazing first month meeting the hard working, dedicated APP and Ribblemere staff who have all been so supportive to me while I get to grips with this new role. 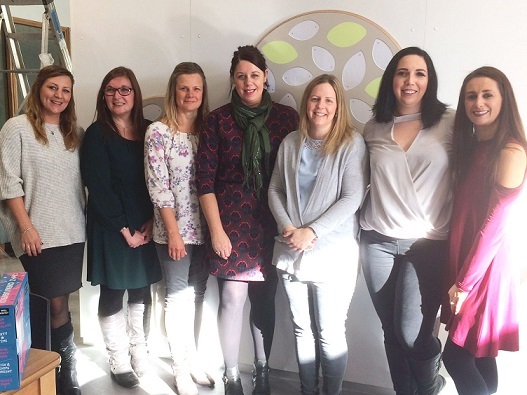 During my first month Ribblemere has opened its doors to patients and admitted four mums that I have been able to spend time with along with some of their partners/family. I have met and spoken to many local APP volunteers who want to be involved in this exciting project. It has been great to hear their personal experiences. They are all amazing in the way they are wanting to give up their time to support other women suffering from PP. Training for volunteers will be running in January. I also attended the APP volunteer event in Birmingham and met more inspirational volunteers and was fortunate to watch the brilliant film, Irene’s Ghost. I am now looking forward to the future months working for APP and developing this project. Thank you to everyone involved. If anyone wants to find out more or get involved in this project, please get in touch with me at linda@app-network.org"